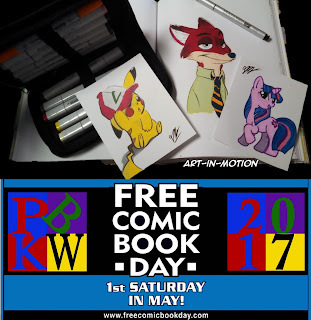 The Homeschool Gossip: Free Sketches at Free Comic Book Day May 6 in Cornelius! Free Sketches at Free Comic Book Day May 6 in Cornelius! Celebrate Free Comic Book Day at Parker Banner Kent & Wayne - Comics & Games in Cornelius! One of our own homeschooling local artists, Gabbi of Art-in-motion, will be there doing free sketches along with Freelance Inker Ed Eargle, Freelance Artist Rob Retiano, and Freelance Artist Pablo Agurcia! So go on over and show your support and get your kids some free sketches and comics! "It's that time of year again -- Free Comic Book Day! We'll be giving away some great comic books like Betty & Veronica, Doctor Who, Rick & Morty, Spider-Man, Star Trek, Zelda, Wonder Woman,Guardians of the Galaxy, Barbie, Buffy the Vampire Slayer, DC Super Hero Girls, Spongebob, Monster High, The Tick, TMNT, and much more!! There will be a few local artists making sketches!"